For a memorable holiday filled with sun, sand, sea – and Tannat – head to Maldonado, Uruguay’s newest and most exciting wine region along the Atlantic Coast. Patricio Tapia reports in his Uruguayan coast travel guide. People applaud when watching the sunset in Punta del Este. Gazing over the sea in one of South America’s most famous and chic Atlantic coast resort towns, they clap as the sun disappears into the horizon and fall silent before the reddened sky hanging over the water. Then they make a toast. 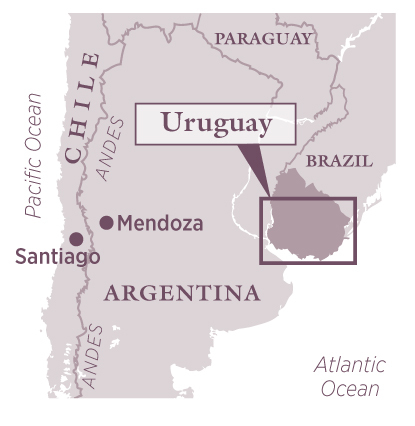 With just under 9,000 hectares of vineyards, Uruguay is boutique in South American terms, compared with Argentina’s 200,000ha or Chile’s multi-zeroed international export figures. That’s not a lot of Uruguayan wine to toast sunsets. But what there is, is good. And sometimes, it’s excellent. 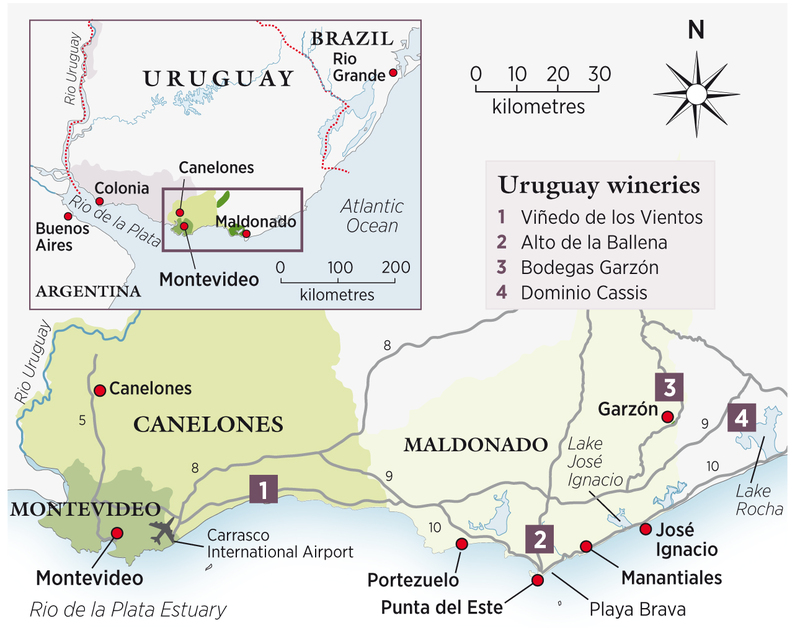 Nearly 80% of those 9,000 hectares are concentrated around the country’s capital, Montevideo, in the wine region of Canelones. Some of Uruguay’s best-kept wine secrets hail from here – especially secrets made with Tannat, a rustic and difficult variety that can produce sublime wines, but only when planted in the right place and treated with care. If you turn right as you leave the tiny but very modern Carrasco International Airport, you can drive to Montevideo in 40 minutes; just a short while longer and you’ll reach the country’s most important wineries. But if your plan is not only to drink wine, but visit lovely beaches too, then turn left toward Punta del Este, towards the grey-sand beaches of José Ignacio, the rural peacefulness of Garzón and those applause-filled sunsets. Visit Maldonado, the newest of Uruguay’s wine regions. The first winery along the route – actually still in Canelones but just 30 minutes’ drive from the airport – is Viñedo de los Vientos (www. vinedodelosvientos.com). Just 5km from the Río de la Plata estuary, this little winery owned by Pablo Fallabrino and his wife Mariana Cerutti is unlike any other in South America. With 16ha of vineyards and a production of 60,000 bottles a year, the couple make truly unique wines. Take Estival, for example. A blend of early-picked Chardonnay, late-picked Gewurztraminer and equally overripe Moscato Bianco, it is an unusual white, but in a very good way. Fragrant and juicy with the acidity brought by the winds off the Río de la Plata, it is a perfect summer aperitif. There’s not the space to delve into some of the other delicious oddities here (Fallabrino and Cerutti make wines more by instinct than by oenology), but the Viñedo de Los Vientos tasting room is worth a detour. As is their food. The winery’s stand at the Tannat & Lamb Festival, organised by the Caminos del Vino wine tourism route every June, is the one of the event’s most popular, with meat that falls off the bone, served with one of their rich Tannat blends. Despite June being the month for drinking Tannat and eating lamb, the weather on the Uruguayan coast can be ruthless. It’s best to visit during summer, from December through to early March. The sun is almost guaranteed to shine and the water is certain to be warm. Perfect conditions to continue along our route to Alto de la Ballena (www.altodelaballena.com). A half hour’s drive from Punta del Este, this 9ha vineyard extends out over a hillside facing the Atlantic, some 14km away. The view from the top is unbeatable: the landscape is dominated by gentle, green-carpeted slopes with the silhouette of the sea in the distance. Breezes slide across these rocky soils as if they were a skating rink. It was here in 1998 that husband and wife Paula Pivel and Alvaro Lorenzo decided to turn their backs on careers as business executives and devote themselves to wine. It has been a radical change but a successful one, and they now make very fresh Atlantic-influenced wines, such as the Cetus Syrah that grows in the highest part of the vineyard on impossibly rocky soils. Cetus is fresh with lively acidity (indebted to the sea breezes) and a firm, compact structure (indebted to the soils) that is drinking very nicely now, but will benefit from another decade in bottle to gain in complexity. If you don’t have the patience to wait, drink it when you visit the estate and enjoy the views from the new barbecue area at the top of the vineyard. The views continue if you drive further east. After passing Punta del Este, turn inland about 30km to reach Garzón, a charming town lost among Uruguay’s rolling hills. In the midst of this landscape is the estate of Argentine magnate Alejandro Bulgheroni, Bodegas Garzón (www.colinasdegarzon.com), a vast stretch of land that, among other almond and eucalyptus trees, includes an oil mill that processes three million kilos of olives a year. Italian wine consultant Alberto Antonini is in charge of production at this ambitious estate that currently has 200ha planted to vineyards – by far the Maldonado region’s largest – although there are plans for 500ha. The wines are very international in character – ripe-fruited Tannats with gentle tannins, as well as Albariño. Garzón’s entry-level Albariño is deliciously fresh and simple – perfect with miniaturas, little chunks of fried fish sold in every bar on the beach, just 20 minutes’ drive away. The last and most eastern winery on our trip is Dominio Cassis (www.bodegacassis.com) – a pioneer in venturing into this exciting Atlantic coastal area. In 1999 Carlos Tomassi bought some land on the banks of Lake Rocha, about 10km from the sea, where rocky soils are bathed by Atlantic winds, and the wild and charming landscapes imbue the wines with the flavours of the Uruguayan countryside. Domínio Cassis produces mainly reds, including a fresh, juicy Cabernet Franc that shows a real sense of place. Like other estates in Maldonado, wine production is not yet two decades old, but the charm of the scenery and warmth of the people make it well worth visiting. And when you do, raise a glass of its wines to the setting sun.